« At long last: a finished project! Another finished project. Once again, started while still living in Quito. Just needed to be quilted and binding added. Now, there is something strange about this project. I can’t remember where I saw this tutorial (it’s been at least five years! ), but it consisted in applying fabric paint to the glue side of fusible web and then ironing it on to the right side of the chosen fabric. So you are adding another layer of texture with the fusible web/paint, and by applying it to the right side of the fabric you can continue to add things on to the surface… bits and bobs like lace or yarn, etc. Heat set (using a teflon sheet) and you can continue to add things as you see fit. The concept is interesting, but I don’t think I will do any more projects with this technique. Having glue on the right side of the fabric presents the danger of accidentally touching it with the iron and ending up with a hot mess. It was, however, a chance to learn something new and experiment. Why not? I am a self-learner. I taught myself to sew and to quilt. And I taught myself how to draw. 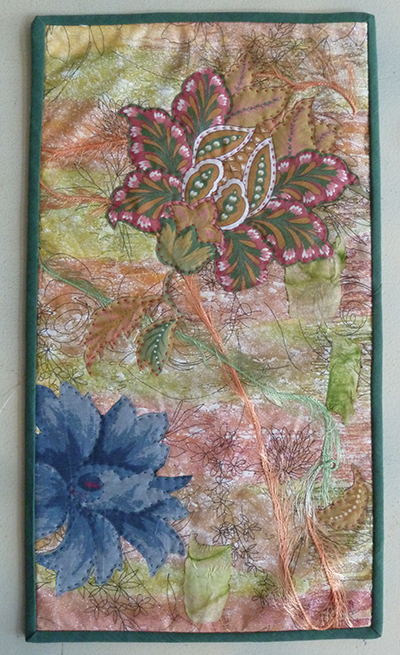 I am learning how to dye my own fabrics and am dabbling with mixed media. I am a quilt designer and teacher, and design and publish my own line of quilt patterns. With this blog I would like to share the bits and pieces of my life. Visit our Websites for Hundreds of Patterns! A ton of online classes!